Plants usually don’t get as much love as cute animals, and sometimes it’s hard to get people fired up about an endangered plant. But Jane Kramer’s trying to do that anyway. Kramer is a fine art photographer who takes photos of the shadows of rare or threatened plants, and then prints those shadows on paper she makes out of invasive plants like garlic mustard and purple loosestrife. 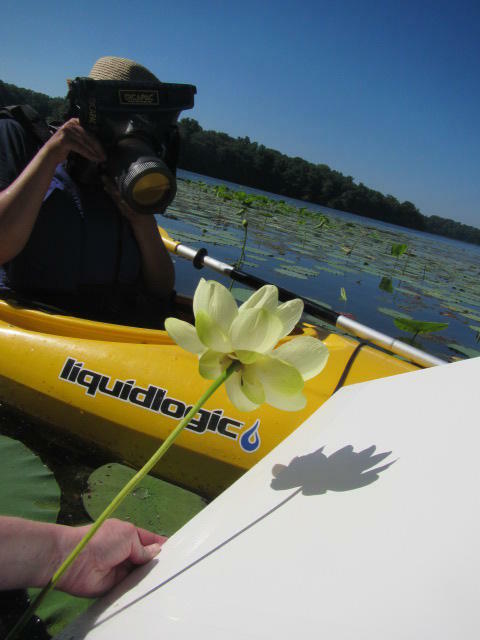 We paddle up to a patch of American lotus and spot its huge yellow petals sticking up out of the water. My job is to hold a white foam board behind the flower and keep it very, very still. “We’re going to try to get close to it so I can shoot from one side and then capture the shadow on the whiteboard while you hold it behind it,” Kramer says. Kramer says she’s drawn to things that are fragile or easily overlooked—and have an element of secrecy. “The location of some of these plants is kept secret because of poachers. They’re afraid of people coming in and either taking the plants or taking the seeds,” she says. After she takes these rare plants’ photos, she tackles the flip side of the project: making the paper from the invasives that threaten them. Then she uses a wood frame to make the pulp into paper. Most of it turns out light brown. Sometimes it’s green. Japanese knotweed makes a very dark red paper. “Now we come to the most stressful part of the whole project,” she says. A lot of things can go wrong in this final phase: transferring the image onto the paper. Kramer prints the shadow images on special transfer films. She has a magic ingredient to get the shadow photos onto the invasive plant paper: hand sanitizer. The alcohol releases the ink from the transfer paper. She squirts hand sanitizer onto the paper, spreads it across the page and then lays the transfer film down on top of it. “You carefully lift up. You’ll see that not all the ink came off, but I really like how that looks,” she says. It’s a delicate-looking shadow of a flower: the prairie coreopsis. This story comes from our partners at Michigan Radio's Environment Report, a program exploring the relationship between the natural world and the everyday lives of people in Michigan. If you’re in Michigan, you can see some of Kramer’s work at ArtPrize in Grand Rapids, September 21 through October 6.